DETROIT (CNS) — When Father Benjamin Kosnac decided to start offering confessions 30 minutes before every Mass, he wasn’t sure anyone would come. But try walking into the chapel at SS. Cyril & Methodius Church in Sterling Heights on any given weekend now, and you won’t find a seat that isn’t taken. Despite the efforts of Father Kosnac and two or three other priests, who are tucked away in confessionals churning through as many penitents as possible before the bells announce the start of Mass, the lines just don’t seem to get any shorter. Father Kosnac has been offering daily confessions for 18 years at his parish, and during that time he has seen a steady growth of parishioners and non-parishioners alike seeking the sacrament. In fact, with many statistics showing the number of Catholics frequenting the sacrament is down overall — consistent with trends showing declines in other aspects of sacramental participation, including marriages and baptisms — it might seem counterintuitive to offer more options for confession. But for some parishes, it’s been a way to encourage more people to return to the sacrament. Father Nick Zukowski said Catholics from across the vicariate increasingly come for Wednesday evening confessions and Mass at St. Martin de Porres Church in Warren. In fact, apart from the spiritual benefits, a 2014 survey of the faithful in the Archdiocese of Detroit showed 40 percent of active Catholics rated opportunities for confession as “very important” to their choice of a parish. But perhaps more stunningly, it was the most important characteristic for one of the most coveted age groups: teens and college-age adults. It’s a finding that doesn’t surprise Chris Gawel, young adult and campus ministry coordinator for the Archdiocese of Detroit. 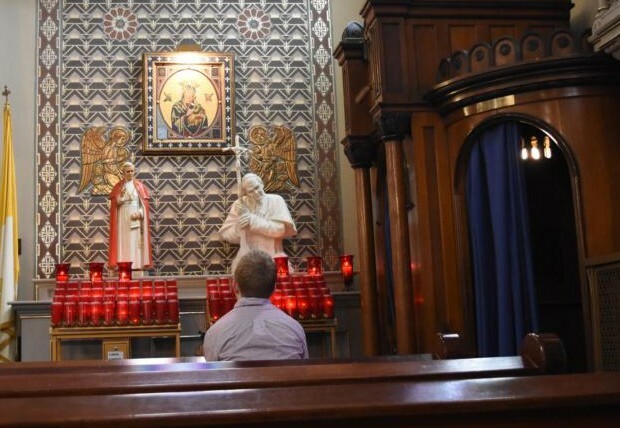 If young people can attend Mass, go to confession and stick around for fellowship afterward, they’ll attend more frequently, Gawel contends, because their schedules often don’t allow them to break away on multiple days. Father Zukowski pointed to the archdiocese’s “Unleash the Gospel” initiative and the Year of Mercy as opportunities to emphasize the benefits of sacramental confession. On March 4-5, several parishes hosted all-day confession and adoration services called “24 Hours for the Lord,” an initiative of Pope Francis for the Year of Mercy; many other churches are hosting vicariate-wide penance services during Lent. It isn’t just young people who are increasingly looking toward confession; working professionals, too, can often benefit from a listening ear on a tight schedule. St. Bonaventure Monastery in the city has a Capuchin friar available Monday through Saturday every hour, on the hour, from 10 a.m.-4 p.m., with the exception of a break at 1 p.m. for lunch. Old St. Mary’s Church in downtown Detroit’s Greektown offers confession 20 minutes before its 12:15 p.m. daily Mass. When all else fails, in addition to offering set confession times, most pastors also invite parishioners to schedule private confessional appointments by calling. Father Zukowski said whatever the circumstances, a priest’s door is always open for his flock — even during “off hours” — and no one should feel intimidated by calling and asking for a confession.